My first days in Chambéry, though thrilling, included probably the most anxiety-filled moments I have ever lived. Why? you ask. How could you possibly be stressed while surrounded by stunning mountain ranges around every corner and all the croissants and éclairs you can eat? Because, dear readers, I was functionally homeless for about two weeks. Add in the fact that pretty much every single administrative task we need to complete requires a justificatif de domicile, or proof of housing, and this limbo status quickly resulted in doing basically nothing that first week except frantically calling and emailing potential landlords, or staring at my computer screen, paralyzed with anxiety (I’m mostly exaggerating…mostly). France is just full of Catch-22s. For example, you need an address to open a bank account, but some agencies require bank account to rent an apartment. Or, you need an address in order to receive a SIM card (only if you order online. I HIGHLY recommend not doing that and going to the store in person), but it’s nearly impossible to contact landlords or agencies without a French phone number. Or, you are required to have housing insurance to rent an apartment; most banks offer inexpensive insurance plans with your account, but you can’t open an account – yep – without an address. (Although, sidebar: Don’t stress too much about this. Most landlords, particularly if they are particuliers – or private individuals, rather than an agency – may be somewhat lenient if you explain your situation.) I could go on. I scanned leboncoin.fr, the French version of Craigslist, every day and pretty much emailed every single ad for furnished apartments near the centre ville that had been posted. If there was one I really liked, I would spend half an hour working up the courage to make a foreign-language phone call. Usually, I never heard back. Or I would reach the landlord and they would tell me it had been rented yesterday. Super. Finally, after days of stress, a move from one Airbnb host to another and sick and tired of living on the 7 outfits I had packed in my carryon but not able to unpack my entire suitcase, I came home to a message in my voicemail from an unknown French number! I understood about 80% of what she said, managed to call back and set a date to visit. Thank heavens for Google Maps because I had absolutely no idea what she said the address was…after asking two times to repeat it, I still only heard sounds…no words. So, I typed in what I thought I heard into Google Maps letter by letter, sound by sound, and lo and behold, the auto-complete function directed me to 5 Place Porte Reine!! Long story short, the room was available immediately and even though the landlady told me to take the weekend to think about it, I pretty much left knowing that I wanted to sign for it. The apartment was spacious, the room furnished and sunny and did I mention that it was available immediately?! I called her back that afternoon. It’s a 20m2 room in a 5 person colocation, or flat-share. One thing that’s really different here is that it’s possible to have a separate lease for every room in an apartment. Whereas in the US, the entire group signs one lease all at the same time, here it seems to be much more common for landlords to rent the rooms individually whenever they become available. Along with my furnished bedroom, the apartment has a kitchen and sitting room plus two bathrooms and showers. It’s on the top floor of a long spiral staircase in a very old building that many of my friends have called un chateau! a castle! My roommates are all really nice and chill. I think they will be very easy to live with! There’s Manon and Andréa who are friends from the University here. Then Nico who works doing….something. And finally Sandy; I have been told not to expect to ever meet her because she is apparently never here. Okay. Andréa even speaks English very well, so I won’t be totally alone. For now, it seems like everyone tends to keep to themselves a bit, but I’m hoping we’ll become closer friends as time goes on. 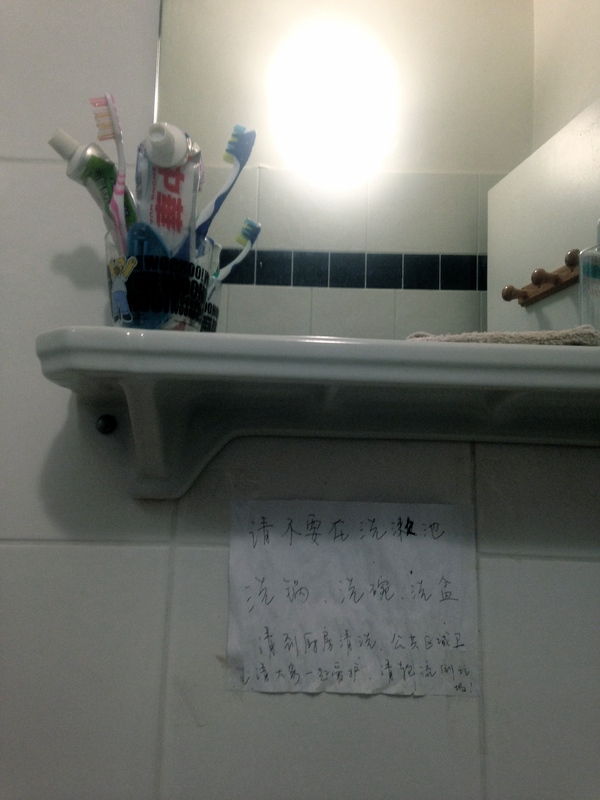 And, apparently I took the place of a Chinese girl who left behind this note in the bathroom (along with some Chinese toothpaste and a jar of Chinese Skippy peanut butter)…If anyone knows Chinese, I’d love to know what it says. It is hard to describe the sense of relief the mere unpacking of a suitcase has. The significance of adding four new keys to your key ring which now jingles in your pocket or purse every day. I have been lucky. My search only lasted 15 days. I know people who were searching for 3 weeks. A friend is currently sleeping on my couch because she still hasn’t found anywhere. But the good thing about Limbo is that it can’t last forever. For any future assistants reading this, (or current assistants still struggling…..) I wish I could give you clearer advice for a worry-free housing search, because goodness knows I could have used some myself, but the best I can tell you is this: It’s going to be hard. It’s going to be terrifying. But you can do it! Absolutely network with other assistants who plan on living nearby before arriving as these could be your potential roommates. Check leboncoin (and other sites like appartager, etc) every day since new postings are made all the time. Calling will get you more responses, but if for whatever reason you can’t call, try to include a French phone number for the landlord to call you back (this is where local or assistant friends can help you!). People don’t seem to like email here… I also know assistants who chose to go for homestays or student residences; depending on where you’re placed there may be lots of options! Be ruthless, don’t give up, try not to be overly picky, and you will find something! Be sure to ask if utilities (les charges) are included in your rent and if not, how much they generally are per month. Ask your landlord if the room is eligible for APL (aide personalisée au logement), sometimes also referred to as CAF (caisse d’allocations familiales, the office that oversees APL requests) subsidies, and BRING THE FORM WITH YOU when you sign your lease or pick up your keys. There’s a section the landlord must sign and fill out, so you might as well settle it right away. When you visit the apartment, ask the landlord to explain everything that you’ll need to sign the lease. For me, in lieu of a guarantor, I needed to give a copy of my work contract, to prove that I was employed. I asked if I could pay the safety deposit in cash initially, since I don’t yet have checks from a French bank. Be aware that rental agencies may have even more demands, including tax returns and pay stubs, and may not be as lenient. Housing insurance is usually mandatory and your landlord may ask you for a proof of insurance when you sign the lease. Most banks offer their account holders insurance, but you probably won’t have an account, since you don’t have an address (Thanks, France!) You may be able to negotiate with your landlord about this, if you explain the situation and promise to send them the proof of insurance as soon as possible. You can also Google search “assurance habitation jeune actif” for some insurance companies that offer pretty cheap annual subscriptions. Here is a list of the websites I used to search, ranked more or less by usefulness. I feel really lucky that my search ended relatively quickly; I have friends _still_ looking!! I do agree that the dread can be self imposed, but it’s understandable! That much uncertainty and vulnerability is incredibly challenging. But, it also allowed meet some truly kind and generous people, so everything works out in the end!! Anne — very nice blog — well-written with great humour, advice and photos! Best of luck to you in your new endeavours … and certainly, you shall return to France one day!